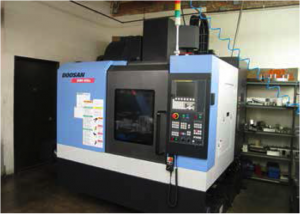 AUCTION DATE: STARTING WEDNESDAY SEPTEMBER 30, 2015 @ 10:30 A.M.
2014 DOOSAN DNM 400a CNC VMC, CT-40, 20 ATC, FANUC I CONTROL, 30’’ X 17.1’’ X 20.1’’ (XYZ), S/N MV0038-000283. 2004 DAEWOO DMV 3016D CNC VMC, CT 40, 20 ATC, 30’’ X 16’’ X 20’’ (XYZ), 8000 RPM. 2010 SHARP SV2412-S VMC SUPER MILL, FANUC O CONTROL, 20 ATC, CT-40. 1998 CHEVALIER 2552 VMC WITH FANUC O-MD CONTROL, 20 ATC, CT-40, 52’’ X 25’’ X 25’’ (XYZ). HAAS HRT 4TH AXIS ROTARY TABLE WITH TAIL STOCK AND SERVO CONTROL. MITUTOYO PV-600 24’’ OPTICAL COMPARATOR, SERIES 305, S/N 9282. MICRO VU 12’’ OPTICAL COMPARTOR MODEL 500HP. BROWN AND SHARPE MICRO VAL CMM. INPSECTION TOOLS, GRANITE SURFACE PLATES, AND SUPPORT. ALUMINIUM MATERIAL, RACKS, PARTS, AND ETC.